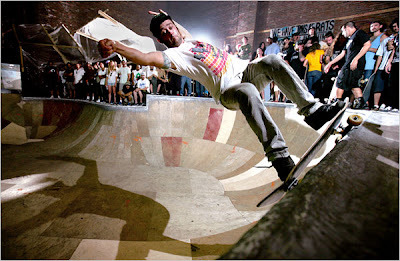 The noise of skateboard wheels thrumming on wooden ramps echoed near the Brooklyn waterfront in Greenpoint on Saturday night, where a semisecret skating spot called the Autumn Bowl is located inside an old brick warehouse. Photographs of the New York City skateboarding pioneer Andy Kessler decorated the walls inside the warehouse, and bouquets of roses sat on a table next to handwritten messages addressed to Mr. Kessler, who died last week at age 48 after an allergic reaction to an insect sting. Click on the link to read the full NY TIMES article.